Tai Ji Circle is a north London school and charity dedicated to sharing and promoting Chen Taijiquan (Tai Chi Chuan) and qi gong (chi kung) practice. Our weekly tai ji classes and monthly workshops for beginners to advanced levels are directed and taught by Liu Quanjun and assisted and managed by Christine Jones, both disciples of Grandmaster Chen Xiaowang, the 19th generation lineage heir of the Chen family Taijiquan, that was the origin of many modern Tai Chi styles taught around the world today. We are also very fortunate to have an annual visit from China of Master Chen Ziqiang, the son of Grandmaster Chen Xiaoxing and nephew of Standard Bearer Chen Xiaowang. 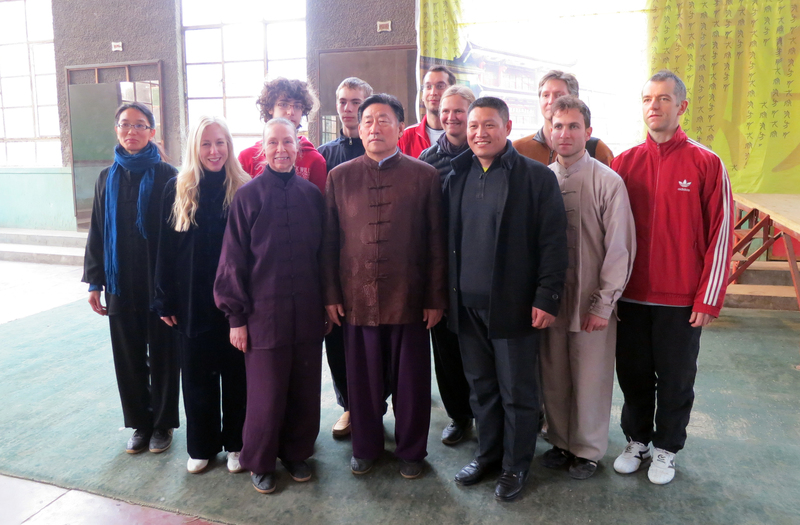 Master Chen Ziqiang is a 20th generation direct descendant of the Chen Taijiquan Family. He is the Chief Coach of the prestigious Chenjiagou Taijiquan Academy and a renowned tai ji teacher and champion. Both he and his students have achieved overwhelming victories in numerous competitions both in China and worldwide. Master Chen’s Tai Ji is impeccable and he is ranked as one of the true great masters within the Taijiquan community. Chen Taijiquan (Tai Chi Chuan is the Cantonese spelling) Tai Chi (Taijiquan of the Chen style) is practiced as a sequence of slow or dynamic movements or forms, that combine ‘soft’ and ‘hard’, with ‘fast’ and ‘slow’ actions. It is performed in a relaxed, balanced and natural way that adheres to the philosophical Daoist (Taoist) principles of Yin Yang, the Chinese theory of opposites. Chen style Taijiquan has bare hand and weapon routines suitable for beginners to advanced levels, push hands and martial applications and techniques. It can be practiced meditatively and slowly in a high stance, or faster in a lower stance for increasing stamina and power, (which makes it different from other tai chi styles) but also makes it suitable for different age groups to practice. Tai Ji Circle runs public London classes and workshops in Chen Taijiquan (tai chi chuan) hand and weapon forms, push hands and martial applications and Tai Ji Qi Gong (chi kung) though our Foundation syllabus. Chen Tai Ji can be practiced for general fitness, improvements to health and for internal martial arts training. Tai Ji Circle was founded in 2004, by Christine Jones (Trustee, Manager and Instructor) under the guidance of Shifu (Master) Liu Quanjun who has been its full time Martial Arts and Executive Director and Senior Instructor since 2005. They are both disciples of 19th generation Chen Taijiquan lineage heir, Grandmaster Chen Xiaowang. In February 2012 we changed the company status to Tai Ji Circle Ltd as a not-for-profit, and on 25 March 2013 Tai Ji Circle was awarded charity status. Tai Ji Circle is fortunate to have wonderful support from it’s trustees and student volunteers, see our team on the link below. Tai Ji Circle embodies authentic and traditional principles of Chinese internal martial arts and Chinese medicine. 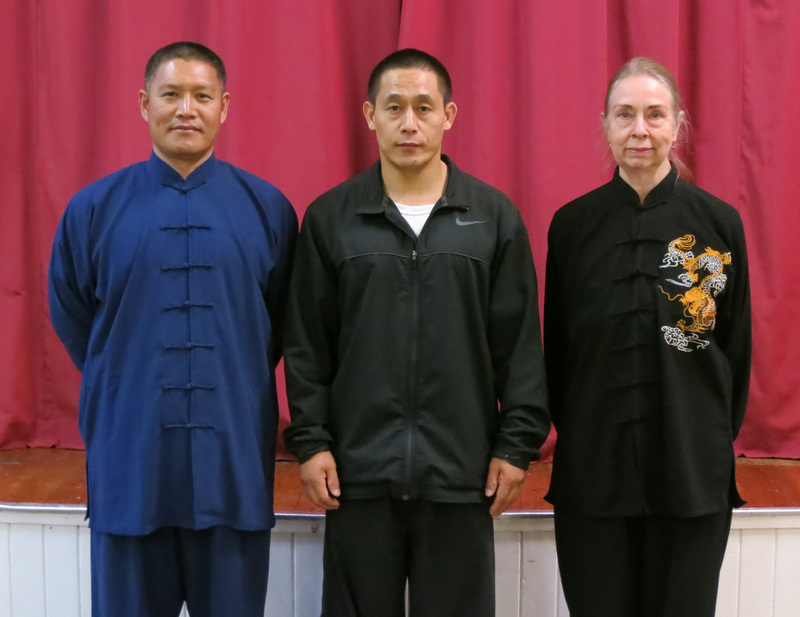 Through a wide range of weekly Chen Taijiquan (Tai Chi) classes and workshops, students of all ages and levels of fitness can benefit from the expert teaching of Shifu Liu at affordable prices. Tai Ji Circle hopes to promote a healthy way of life for their students, who come from the local community, around London and from all over the world. Everyone welcome! Tai Chi is both an internal martial art and a form of meditation through flowing circular movements that help strengthen and balance the body and mind. The mental and spiritual focus required to perform it correctly, frees the energies of the body to flow naturally. Tai Chi Qi Gong practiced in Foundation classes is meditative and relaxing and is also suitable for those with health issues who cannot stand for long. Discover the roots of Tai chi with Tai Ji Circle and try the traditional form of Chen Taijiquan (tai chi) with renowned London Chen-style master Liu Quanjun and team. Learn how to relax and benefit health through our practical Foundation Courses, and discover the hidden power in this authentic internal martial art, and understand underlying theories and philosophies that underpin the Chen style. Each new Beginners’ Foundation Course offers eight classes taught by Shifu Liu with Chris and Darrell, and require you to attend two classes a week for four weeks on Sundays and Thursdays. This will help new students have time to assimilate the training. The course will begin with the fundamentals and progress each week building firm foundation techniques. If you are unable to attend twice a week you can use the 8-class pass to attend other Foundation classes within the term. Whether you are new to Taijiquan or more experienced, practicing the foundation training is necessary to build strength, calmness, to gain full energy, which is essential for more advanced practice. Our courses are recommended for all students to gain a grasp of the essential requirements of the Chen style. Everyone welcome, no previous experience is required. If you have health issues please let us know and have permission from your doctor before joining our classes. Those TJC members with with previous experience are welcome to join in the Foundation Course classes and use their regular class passes as before. • Understand how the martial applications are within apparently simple movements even at the Foundation level. Sign up for our 2019 Foundation Chen Courses. Grandmaster Chen Xiaowang was born in 1945 in Chenjiagou (Chen Village), Henan Province, China and is currently the standard bearer of the 19th generation of the Chen family. He is a senior national martial artist and professor in the Chinese Martial Arts International Promotions Centre. Upon the solid foundation of the experience of his ancestors, Chen has not only been successful in Taijiquan himself, but has tirelessly promoted his “family martial art” throughout the world. He is direct descendent of the legendary Chen Wang Ting, originator of Chen Taijiquan in the 17th Century, and the grandson of Chen Fa’ke, renowned as the greatest Taijiquan master at the beginning of the 20th Century. At a very young age, Chen received rigorous training in Chen family Taijiquan theory, forms, weapons, push hands, and free sparring from his father, Chen Zhaoxu, and his uncles, Chen Zhaopi and Chen Zhaokui. In 1980, he became a board member of the Henan Institute of Sport and began teaching Taijiquan professionally. He entered the National Taijiquan Competition winning gold medals for three consecutive years (1980-82). In 1985, he represented China in the First International Martial Arts Invitational Competition in Xi’an receiving the World Champion title for Taijiquan. Chen continued to compete in sizable competitions and was awarded the title of champion in Taijiquan more than twenty times. Chen served as the sole deputy elected from Taijiquan circles to the Chinese National People’s Assembly. In 1988, he was awarded the Contribution to Martial Arts prize by the National Institute of Martial Arts, and the Chinese Government recognised him as a “Living National Treasure.” He is recognised as one of four “Buddha’s Warrior Attendants,” the four outstanding exponents of the 19th generation in Chenjiagou. Chen Xiaowang was chairperson of the Henan Province Chen Push Hands Taijiquan Association; deputy head of the Wushu Academy of Henan Province; and technical advisor and official assessor for the standardised competition routines for the Chen, Yang, Wu, and Sun styles of taijiquan. In 2010 he was honoured with the highest distinction in Chinese martial arts, the 9th duan wei. He has represented China sharing martial arts knowledge with people all over the world. His deep Taijiquan skill has allowed him to defeat all martial artists who have challenged him. Over many years, Chen has taught tens of thousands of Taijiquan students both in and outside of China. Chen has held many positions of leadership in areas of martial arts, calligraphy, culture, and Chinese medicine and currently holds various positions in many international and Chinese Taijiquan institutions. He was the principal in the films on Chen family Taijiquan produced by Chinese Central Television (CCTV) and has choreographed and directed martial arts films. Additionally, he authored a number of renowned books and essays on Taijiquan. His books and videos have been translated into many languages and have been published worldwide. Chen is also leading a project to rebuild the house of Chen Changxing, the fourteenth generation Chen family. A project made possible by the contribution of his disciples and all the students who have bought his beautiful calligraphy, (example right) “Jing , Qi, Shen”, Essence, Energy, Spirit, which TJC use the motto on our T shirt. Chen has contributed significantly to the international promotion of Taijiquan. In 1990, he left China on a mission to promote Taijiquan to the world. He established the World Chen Xiaowang Taijiquan Association and has since been touring Europe, North America, South America, and Asia promoting and teaching Taijiquan. The distance he travels each year is equivalent to twice the circumference of the earth. In February 2003, he accepted an invitation to return to his hometown, Jiao Zuo, to author a Taijiquan book for elementary and high school students. Both the people and government of Jiao Zuo warmly welcomed him. Chen’s big heartedness, his outstanding Taijiquan skills, and his personal characteristics make him highly respected around the world. He is truly the most outstanding Chen family Taijiquan master of his generation and a world-renowned martial artist.